Trouble is afoot at Alton Towers, as Grandmaster Glitch has plans to turn the ruins into a giant goo factory. 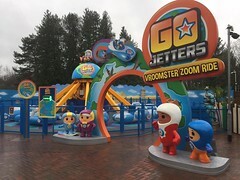 Luckily Ubercorn has called in the Go Jetters to helps clean up the mess. Join Xuli, Kyan, Lars and Foz aboard your very own Vroomster and take to the skies above CBeebies Land to give them a hand in fixing the glitch. Ubercorn has even provided you with your very own click-on that lets you choose how high you want to go. 1) The ruins in the centre of Alton Towers were built as the home of the Earls of Shrewbury in the Victorian era. 2) The house is in a gothic style, which means the builders made it look like a castle from the middle ages despite it being much more modern. 3) You can still explore the ruins today. Who knows, you may even meet a friendly ghost inside!